Edward Scott averaged 7.93 assists per game, third best in thenation. It was the first time a Clemson player ranked in the topfive in the nation in any statistical category since Sharone Wrightwas second in the nation in blocked shots in 1992-93. Scott had 30points and 16 assists in the double overtime win over Wake Foreston Feb. 13. It marked just the second time in history that an ACCplayer had at least 30 points and 15 assists in the same game.Longtime NBA player Kenny Anderson (Georgia Tech) is the only otherACC player to do it. Scott scored 36 points in a win over FloridaState on Feb. 23, the fifth best single game scoring total by aClemson point guard in history, best in 32 years. Scott earnedthird-team All-ACC honors, meaning a Clemson guard made an All-ACCteam for the sixth straight year. He averaged 11.9 points per gameto go with his nearly eight assists per game. He also collected 4.9rebounds per game, most by a Clemson point guard since the 1957-58season. He had six double-doubles, most ever by a Clemson pointguard in one season and most by an ACC guard in 2001-02. Scott’sfinal assist total of 238 ranked second best in Clemson history.But, his 7.93 assists per game broke Grayson Marshall’s singleseason mark of 7.71 per game. Scott now has 434 career assistsentering his senior year, fourth best in school history. His 2.19assist/turnover ratio was third best in Clemson history. TonyStockman ranked third in the ACC in made three-point goals per gamewith a 2.86 mark. He was also eighth in percentage and 12th insteals per game. Stockman made 80 three-point goals, fifth bestsingle season in Clemson history. He made eight in the first halfat North Carolina on Feb. 27, the most in a single half in Clemsonhistory. Stockman enters his junior year with 155 careerthree-point goals, fourth best in Clemson history. Ray Hendersonranked second in the ACC in rebounds per game with an 8.8 figure.He was sixth in blocked shots and sixth in offensive rebounds.Henderson ranked sixth in the ACC in double-doubles with nine.Sharrod Ford had 12 points and 11 rebounds against Florida State inthe ACC Tournament, the first Clemson freshman to record adouble-double in an ACC Tournament game since Iker Iturbe in 1995.Ford set a Clemson freshman record for field goal percentage with a.606 mark. Jamar McKnight was one of the most improved players inthe ACC. His scoring average improved by 9.2 points per game overthe previous season, seventh best single season improvement inschool history. Chris Hobbs shot 54.1 percent from the field forthe season and now has a 55.07 career field goal percentage, sixthbest in Clemson history. Chey Christie was Clemson’s top freshmanscorer with a 5.3 average, including a 21-point night in CameronIndoor Stadium against Duke. He was named ACC Rookie of the Weekfor the first week of December. Tomas Nagys concluded his season ona positive note with 18 points and 9 rebounds against Florida Statein the ACC Tournament. He made 5-6 field goals, including a tip-inthat tied the game with 0.6 seconds left, sending the contest intoovertime. Led the ACC in rebound margin with a +5.1 figure. That was thethird best rebound margin in Clemson history for the course of aseason. First time Clemson has won the rebound championship since1984-85. Clemson had two of the top three sophomore scorers in theACC in 2001-02. Tony Stockman was the top sophomore scorer with a12.2 average, while Chris Hobbs was third with an 11.6 figure.Clemson had two of the five ACC sophomores who averaged doublefigures in scoring over the course of the season. Clemson scored118 points in the double overtime victory over Wake Forest on Feb.13 at Littlejohn Coliseum. It was the most points scored by an ACCteam in 2001-02 and the Clemson record for an ACC game. It wasClemson’s first double overtime win in 14 years. Clemson showed astrong comeback ability in 2001-02. Three times Clemson overcame adouble digit deficit to gain victory, including the road win atPenn State in November. Clemson returns players who accounted for83 percent of its scoring, 89 percent of its rebounds, 93 percentof its assists, 91 percent of its steals and 91 percent of itsblocked shots for the 2002-03 season. Returning frontcourt startersRay Henderson and Chris Hobbs are both ranked in the top 10 inClemson history in field goal percentage with figures over 54.5percent. Clemson showed improvement in virtually every area in2001-02. That includes victory total, overall, in the ACC and awayfrom home. Clemson also realized an increase in scoring average,scoring margin, rebound margin, field goal percentage, field goalpercentage defense and double figure scorers. Clemson had fourplayers average in double figures for the season, the first Clemsonteam to do that since the 1971-72 season. Clemson won at GeorgiaTech on Jan. 5th, just the third time in 15 years Clemson won inAtlanta. Clemson gained two wins over top 20 teams in 2001-02. TheTigers defeated a fifth ranked Virginia team and a 17th ranked WakeForest team. It marked the first time since 1997-98 that Clemsondefeated two top 25 teams in the same year. 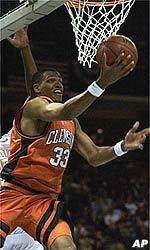 Clemson had sevenformer players in the NBA in 2001-02, 10th most in the nation andthe most in a single year in Clemson history.